This is not intended to be a post about the cruelty that is cancer and how we lose too many, too young (Mr. Iwata was only 55 years old). It isn’t even an attempt to speak as some type of industry “insider” as my years of being in the quasi-loop in the video game world are long behind me. Honestly, I’m not entirely sure what this entry IS about, but I didn’t want it to be those things. I have been a Nintendo fan ever since I was little. I grew up, almost for my whole life, with Nintendo. As far back as I can recall, video games were always a part of my life. I have become something of a collector over the years. I remember going to the local video store and renting an NES console and games because we did not own one (I would assume it was because of cost, but I cannot say exactly why). I was two years old when the NES launched. My family did not purchase an NES for another 3 years, maybe 4 years (I want to say we bought one in the Summer of 89, but it may have been 1990). For what it is worth, though, I grew up with the NES as an integral part of my childhood. I remember the first time we rented the NES from the local video store and brought it home, got it hooked up, and invited neighbors over to see it and play it. It became a party. The game that got everyone all riled up? Duck Hunt. Duck Hunt became the first party game. Who ever would have guessed 16 years later family would gather in that same living room at Thanksgiving to play Wii Sports? While playing games and being a fan of Nintendo does not define a life, it certainly highlights the importance of games to my personal existence. Gaming didn’t begin or end with that little anecdote. Before the NES, I played the Atari 2600 we kept in the closet. I have a Wii U and a PS4 now. Playing video games, in some way, has been part of every major phase of my life. And now, standing somewhere in the vicinity of the next phase of my life, gaming is still important to me. We need to take a few steps back in time, though, to see where this is all going. When I was in high school, I had become friends with some people through a variety of message boards and chat rooms, all of which were about Nintendo gaming. It was with those friends that we began a website called “Gamecube Cafe.” It was a blog before blogging became something everyone and their mother did (yes, I’m well aware of the meta-ness of reading about blogging on a blog while blogging about blogging. I’m waiting for Xzibit to show up.). It was a blog featuring previews, reviews, columns, cartoons, podcasts (again, before podcasting really became a thing that everyone did). We had a few very dedicated writers. Most of us sucked. We were all pretty much high school age or first year of college. Many of us had aspirations to be writers of some sort, but we also knew it was a starving gig. This was our way of continuing to keep the outflow of words open as well as create a community based around something we all enjoyed: Nintendo games. We would all do our bits and it all went really well. During senior year of high school, we got serious about things. A business license was purchased. We all wrote official submission documents. We submitted documentation. We were granted “Media” status at E3 2003. I did not attend that year because of other obligations, but I did attend the following 3 years. The E3s have run together insofar that I can only remember with specificity certain things from 2006. In a general sense, I remember the 2004 and 2005 Nintendo press conferences and bits and pieces of the show, but 2006 I remember quite well. The media conference at the Kodak theater. Being invited by Nintendo to the Q&A session with Masahiro Sakurai, Shigeru Miyamoto, and Bill Trinen. This Q&A was where Smash Bros. Brawl was unveiled. We were part of something that we could not have imagined years prior. It didn’t end there. We were treated to private access to Nintendo’s booth. We got to interact with other media members and play all of the demos for Wii for hours without the mess of crowds. We got to meet executives from Nintendo and we felt like real industry people, even for a night. During the course of the show, too, we were getting tons of video of gameplay and even some of that video was picked up by IGN. Even toda, video games are still important to me. At my school, we regularly play Rock Band after school. We may even try to set-up a Mario Kart or Smash Bros. tournament this year as a fundraiser and donate the money to a charity. Video games are still a part of my life and they likely always will be. And that brings me back to the purpose for writing this. My great regret is not making an effort to meet Mr. Iwata in 2006 when the possibility was there, as he was omnipresent during E3. With the passing of Mr. Iwata over the weekend, I have been doing a lot of reflecting and attempting to put into words what his death means to me. There is, of course, a sect of the population who will say, no matter what, “well, you didn’t know him.” And that is absolutely true. I did not know Mr. Iwata, at least, not personally. But I knew of him. I knew who he was and what his core values were. I knew what type of executive he was. I am not a person who admires or respects CEOs and corporate Presidents because, frankly, I’m not that thrilled with American capitalism. Of course, Mr. Iwata (and Nintendo as a whole) operated a little differently when compared to business in the Western world. Almost every other blog post eulogizing Mr. Iwata has gone to great lengths to talk about his business savvy and how he guided Nintendo through wildly successful ventures (the Wii and DS) and the less-successful adventures (Gamecube and Wii U). Yes, he was a good executive. So was Mr. Yamauchi. Mr. Iwata was different, though, because he rose to the position of head of Nintendo global not because of being the heir by birth, but, instead, by being the consummate professional and industry leader. Mr. Iwata was never one to go about and brag about his games or his abilities. He was never one to smear it in others’ faces when Nintendo was doing well. Many of you likely can recall his famous keynote speech from the 2005 Game Developer’s Conference. His keynote address began: “On my business card, I am a corporate president. In my mind, I am a game developer. In my heart, I am a gamer.” Most remember that because it spoke to the heart of gaming and gamers alike. It had been a long, uphill fight for gaming as a concept to become much more mainstream. While console gaming continued to grow and gaming as a whole became more popular into the 90s and early 2000s, there was still a small stigma attached to identifying as a “gamer.” The stereotypes persisted for a long time about what made a “gamer.” Many viewed people who played video games as people like the caricatures of the Revenge of the Nerds films or the Comic Book Guy from The Simpsons. And, don’t get me wrong, those stereotypes definitely existed for a reason in the 80s and 90s, but being a “gamer” became a lot more common and accepted within the last 15 years. When Mr. Iwata delivered the remarks at the GDC 10 years ago, we had no way of knowing that we would be using that opening to eulogize the man, but here we are. Over the last few years there has been a lot of fighting across the internet about what makes a “gamer.” I’m not sure there is a definitive answer to that question. My own personal beliefs happen to fall in line with the philosophy of Nintendo regarding gaming – that’s to say, video games and gaming serves one purpose and only one purpose: fun. Gaming should be fun. That fun may involve deep, twisting stories or complex moral issues, or it could simply be driving fast and running around jumping on the heads of silly looking creatures. “Fun” is an inherently ambiguous word because it is qualitative. While we can all agree on fundamentals about film or music or even games that separates the “good” (qualitative) vs the “popular” (quantitative), we all see “fun” in different ways. Many people think Call of Duty is fun. Many others find Destiny to be fun. I couldn’t be any less interested in those games and I do not find them to be enjoyable. That does not inherently make them bad. Likewise, Nintendo’s games are not necessarily made for the demographics that line up to buy Madden or Call of Duty at midnight, but, rather, Nintendo makes games for everyone. That has been Nintendo’s identity, for the good and the bad, under the leadership of Mr. Iwata. Mr. Iwata was not afraid to be bold and try something different. A good executive will steer the ship into uncharted waters and emerge all the better for it. Nintendo has been proclaimed dead at least ten times in the last fifteen years. When the Gamecube finished last in the console war, Nintendo only went ahead and dominated with the DS and the Wii thereafter. I sure am glad that Mr. Iwata bent to the whims of the chattering class and folded the company after the Gamecube. The Wii U is not doing as well as it should (but, reports of its and Nintendo’s demise, once again, have been greatly exaggerated), but the Amiibo have become an incredible success and we are all excited to see what is in store in the next few years regarding the NX (not to mention the next Zelda title which, I suspect, will be treated like Twilight Princess and be released on Wii U and NX). But now Nintendo is without its captain. I am sure that the company had some idea that this day was fast approaching, but they played that hand very tight to the vest. There have been numerous statements from the executives and developers at Nintendo regarding the stewardship of the company. One thing has become clear over the last few days – Mr. Iwata was Nintendo. His philosophy was Nintendo’s philosophy, and not just in a corporate synergistic way. His values were the values of Nintendo and the developers there. Mr. Iwata understood what it meant to be a developer just as much as he understood what it took to be a corporate president. He rose to his position because of his steadfast dedication to making games that were fun to play and could be enjoyed by anyone willing to let them be fun. The passing of Mr. Iwata is a tragedy for all of the gaming world. Much like Batman, Mr. Iwata was the hero we needed, but not the one we deserved. Gaming culture has come a long way, but also has a long, long road ahead of it, regarding equality and discrimination. Mr. Iwata was, by all accounts of those who knew him, an incredibly kind, dedicated man who loved what he did and loved being part of the world of gaming. Universally, people went on to praise his steadiness and his honor as president. We cannot forget that he was the executive who cut his own salary when Nintendo did not meet their financial goals. Instead of laying off workers left and right, he gave a vote of confidence to the workers and cut his own salary. You would be very, very hard-pressed to find that in the West. Mr. Iwata was responsible for some of the most beloved characters and games over the last twenty years. There is no way that anyone could truly replace Mr. Iwata, not that I think anyone would want to. Whoever is chosen to spearhead Nintendo going forward must share the same values and vision as Mr. Iwata did because those are the views of Nintendo as an entity. From the other executives down to the game testers, there are shared values – the values of Satoru Iwata. If you have not had a chance to listen to the GDC speech, please, do give it a listen. I have uploaded a copy of it to Soundcloud and you can download it from there. If ever you needed to know who Satoru Iwata was at the core, you only need listen to this speech. So, we come to the end. After the shock and realizing that he really was gone, we all began to look inward. Look at Twitter and how many posts are under the #ThankYouIwata hashtag. Look at how many eulogies and remembrances have been written about a man many of us did not know. Look at how much art has been created. Look at the number of tributes out there. To say that Mr. Iwata was not influential in all of our lives in some way or another is a lie. Many of our childhoods were spent playing games in which Mr. Iwata had a hand. Many went on to work in the gaming industry in some capacity because of a love for Nintendo games. As Mr. Iwata would often ask us to “please understand,” it has become remarkably clear that we understand; we understand just how important Mr. Iwata was and will remain in gaming and in our hearts. We all understand, Mr. Iwata. 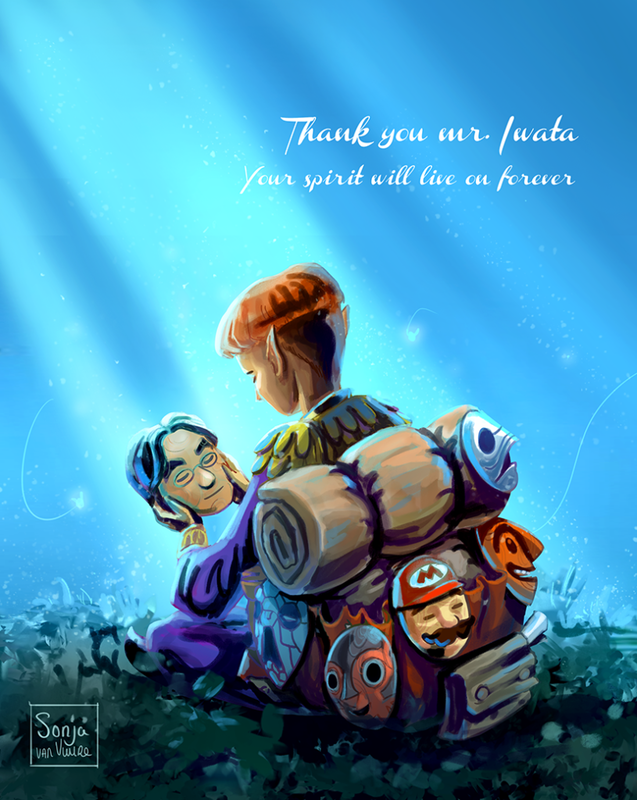 Thank you, Mr. Iwata. I love Duck Hunt! :P. Definitely had similar, fond memories when my sister and I received that console one Christmas (can’t remember if it was the year it was actually released or the following year. But somewhere around there). We played all the time! I would love to play some classic Super Mario Bros. again. I agree with you, gaming should purely be about fun. Taking on too serious or intense roles goes beyond the intent and purpose, I feel. It would make me laugh and have fun with friends or just by myself. It was competitive without going overboard. I also still love classic pinball, admiring the mechanical and creative design, but also because it’s just really fun. You made a beautiful tribute while reflecting on the impact it had and continues to have on you. Again, sharing a side of you that I admire. Thank you!